Updated: This article was originally posted on March 19, but with the current combination of heat, humidity, and oppressive mid-summer temperatures, we thought you guys might like to explore some alternatives to melting foundations. 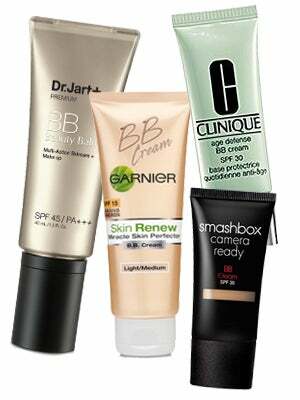 Chances are you've probably heard a lot about BB creams in the past few months. In case you're still not sure what these mythical skin creams really do, here's the deal: BB creams are a type of tinted skin treatment that became a phenomenon in Korea and quickly spread across Asia and into the U.S. The BB cream is similar to a tinted moisturizer— if your tinted moisturizer had taken a bunch of performance-enhancing drugs, bought a Porsche, and was now dating a supermodel. "Tinted moisturizers are too basic — they provide simple moisture and low-level sunscreen, with a few vitamins or extracts thrown in. They work best on perfect skin that doesn't need much love. However, most of us (unless you're genetically blessed) want more coverage," says Sena Kang, general manager of North America for Dr. Jart+. "BB creams are the next generation of product because they contain high-performance treatments like anti-agers, antioxidants, brighteners, and botanical actives combined with high-level sunscreen, coverage, and moisture." We've seen a steady surge of BB creams invade our beauty counters of late, so we thought we'd take these so-called miracle creams out for a spin to see if they live up to the hype. See what our R29 guinea pigs had to say about these super-charged creams and find out if they'll be trading in their tried-and-true tinted moisturizers this spring. Clinique imported its wildly popular BB cream to the U.S., adding two new shades to the lineup, all featuring a host of skin-healthy ingredients. It wears more like a really fantastic moisturizer than a heavy foundation. 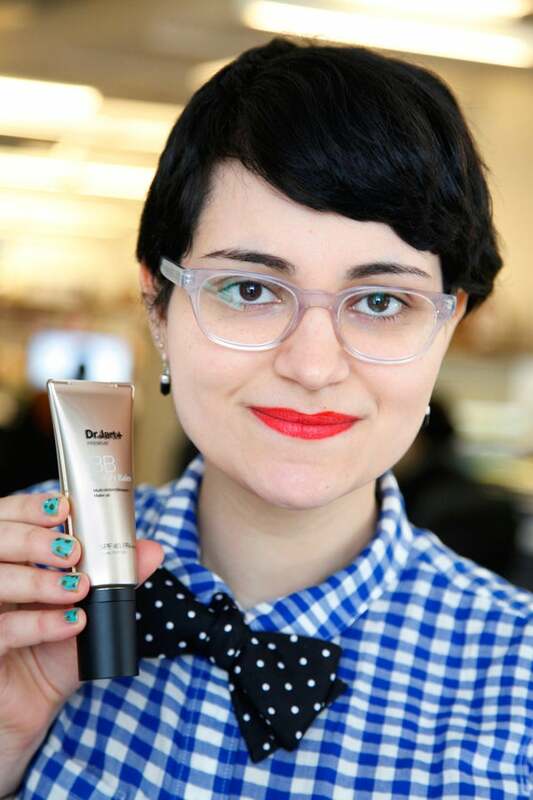 "I honestly haven’t used tinted moisturizer since high school, so this was basically a first for me. Back then, I was a regular fake-baker, so I could wear just tinted moisturizer on my face and nothing else (oh, to be young!). Nowadays, I don’t wear much face makeup — I just brush on some mineral powder. I was definitely skeptical of using the cream at first because it’s much heavier than what I’m used to wearing, and I was worried about distributing it evenly. I ended up mixing it with my oil-free moisturizer, and it went on super-easy. I was pleasantly surprised by how it felt on – I don’t think I could wear it every day, but it made me feel much less “flawed,” if you will. The tint helped cover everything better (especially my giant pores – thanks Mom), and I probably could have gotten away with wearing just the BB cream combined with my moisturizer, and nothing else." Result: "One thing I really liked about the cream is that my face looked pretty much the same at the end of the day as it did when I left the house, which, if you consider the length of my days, is quite a feat. It would be great for a night out when I often come home looking positively dreadful. I did feel more aware that I was wearing makeup, however, and it made the before-bed exfoliation routine super necessary." Clinique Age Defense BB Cream, $37, available at Macy's. Of all the creams we tried, this one wore the most like makeup, providing the most coverage. It also comes in a wide variety of shades — 5 in total, including options for medium and dark skin tones — which is unique considering most BB creams on the market are only available in varying shades of pale. "My usual routine consists of Clinique moisturizer, MAC foundation and powder, plus a dusting of Peter Thomas Roth sunscreen powder. I have dry skin and I need an extended thirst-relief moisturizer to keep my parched skin healthy all day. 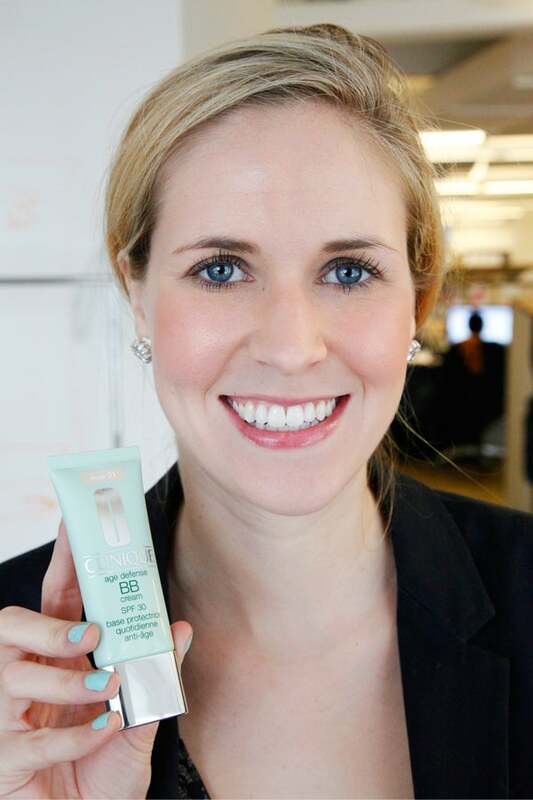 I was a skeptic when I read that the BB cream is a 3-in-1 treatment, but it was pretty good: It kept my face hydrated, felt really light, and was way easy to apply. I used a makeup sponge, which gave me precise application and this cream was so fantastic — there was no unevenness and the light consistency really helped." Result: "My skin felt normal and the product kept me looking fresh all day. I like that I don't need a sunscreen on top of this because it already has SPF 35 in it — it's always awesome to carry fewer things in my purse! My only gripe is that the tint wasn't an exact match to my skin tone, and I may not replace my current product until Smashbox has more variants for different complexions. But nevertheless, a promising product to keep an eye on." 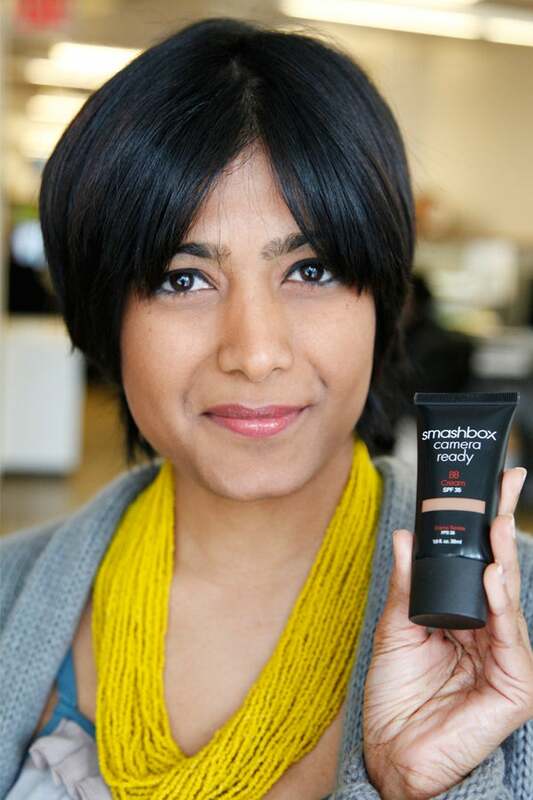 Smashbox Camera Ready BB Cream SPF 35, $39, available in April at Smashbox. One of the original balms to launch in the U.S., this prestige cream is already a hit in Asia and has been spotted gracing the faces of models backstage at Fashion Week. It has a slightly thicker, more balm-like consistency than the other creams we tried, but has tons of moisture and skin-healthy ingredients packed into its formula. "Usually I wear Yes To Carrots moisturizer every day… and that's it. I'm a no-makeup kind of girl (with the obvious exception of bright lipstick) and I've never used a tinted moisturizer before. My skin is really dry, so I was skeptical that this would give me the hydration I needed, and doubly skeptical after seeing how dark the product when I first opened it. However, my fears of coming into the office looking like an Oompa Loompa were totally unfounded. The product went on very smoothly and needed very little blending — it seemed to absorb instantly. As for the tint, it didn't look like I had anything on at all, which was perfect for me because I love my pale skin and was irrationally afraid that the cream would make me look too tan. I did notice that it evened out my skin tone and reduced redness in my cheeks, while still keeping my overall complexion just the way I like it. But, the biggest and best change I noticed was that my skin felt velvety soft all throughout the day, and it felt more hydrated than it has ever been before." Result: "Honestly, there is nothing I disliked about this cream and, although I'm a bit attached to my Yes To moisturizer for being a natural product, I will definitely continue to use Dr. Jart+ regularly because of how it corrected my complexion and hydrated my skin like nothing else has, all without making me feel covered up. In fact, the first thing I did when I came into the office was tell our beauty editor that she'd have to pry it out of my cold, dead hands if she wanted it back. Suffice it to say, I liked this product so much I am willing to go super-cheesy and say this PA+++ gets an A+++ in my book." Dr. Jart+ Premium Beauty Balm SPF 45 PA+++, $39, available at Sephora. The only drugstore option currently available in the U.S., this cream's selling point is that it's easy on your skin and your wallet. "I've used tinted moisturizer before, but it's never provided enough coverage — it dries out my skin by mid-day, and I always feel like I'm wearing makeup, which I can't stand. I have pretty sensitive and oily skin, and I tend to break out when I use any makeup other than a light moisturizer. I know my skin pretty well and am usually adverse to deviating from my routine. However, my Asian friends (who have similar skin types) have been raving about BB creams for years — this seemed like the perfect chance to give it a go! I rarely ever use liquid-based makeup, and never put anything especially thick on, so this was new, but it blended very easily. The smell was a little chemical-y though, and lingered for a while. It seemed to really mask everything without looking like thick foundation. While it provided just as much coverage as the makeup I usually put on, it stayed shiny for too long. It does achieve that "dewy" look, but I'm more of a matte girl myself. Personally, I felt like I looked like I had just been out for a run. I liked that it was so easy to apply, and it really did provide lots of coverage, but I noticed my face would get greasier than it usually does throughout the day. After using it for two days, I started breaking out... and though I could have used the BB cream to cover up the spots, I decided to just switch back to my normal routine." Result: "I'm willing to try out a different brand of BB cream because I'm so attracted to the idea of it, but given my finicky skin and makeup preferences, I can't say that I'll use the Garnier one again — but it might be perfect for girls with less sensitive skin looking for an inexpensive coverup!" Garnier BB Cream Skin Renew Miracle Skin Perfector, $11.99, available at Target.